Large Paintings are too bold, too expensive, and too hard to hang. Do any of these comments sound familiar? Read on to put your mind at rest. 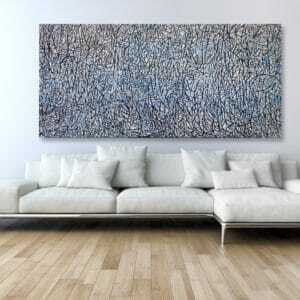 Looking at a large painting can often make one feel intimidated, particularly when viewed on a gallery wall. 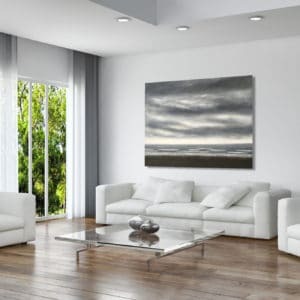 Often people worry that the paintings will be too large for the home and make the room feel small; however, large paintings in the home can create the opposite effect. 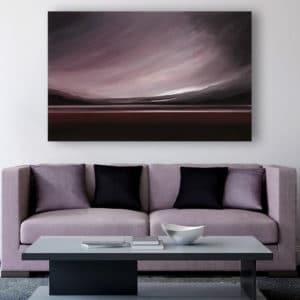 Large paintings can help you tailor the feel of your home, whether you want something calm and peaceful that doesn’t draw too much attention, or you want something more inspiring, large paintings can demonstrate those things along with asserting confidence. 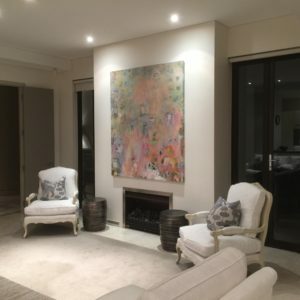 Before listing some facts about large paintings, it’s worth noting that while there are no hard and fast rules when selecting a piece of art, there are definitely things to consider that can help you find and pick the perfect piece. Whether it’s by matching to the style of the room or creating a juxtaposition, consider out what your intention is for space first. 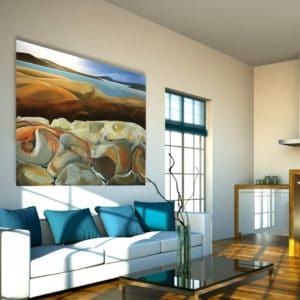 Large paintings can act as a window, adding depth and enhancing the decor or “feel”. Resulting in your room being more immersive. Large paintings can be affordable. Some smaller paintings can be more expensive than the larger ones. We also have a consultation service, helping you to pick the right artwork, the first time. Worried about how to install or transport it? The art gallery you purchased from should be able to arrange this for you. Why not just get a couple of smaller ones? This breaks up space, making the paintings feel like they’re stamped on the wall, rather than creating an immersive environment. 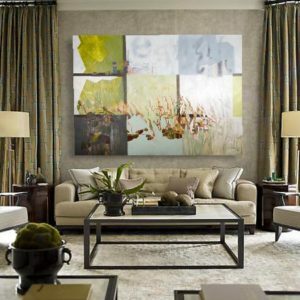 Large paintings can turn a space from empty to immersive, plain to interesting, or from boring to upbeat. Lisa Chandler’s paintings are often very large, featuring non-descript people passing by. Lisa’s attention to detail and layers makes her paintings incredibly immersive as if they go on forever. 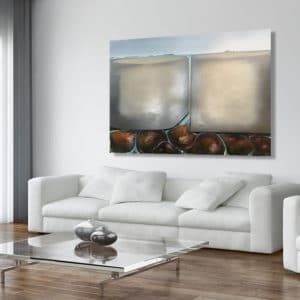 Balancing light and dark, filled and unfilled spaces, Lisa’s paintings are a good fit for the home and corporate space. Lisa’s work suits open spaces with a lot of room for viewing. Good to use in an entrance way or in an open planned kitchen/lounge area. Donna North has a number of styles, from paintings that represent the landscape to some made up of tiny splotches of paint to mimic flowers. A painstaking task of patiently layering colours up. 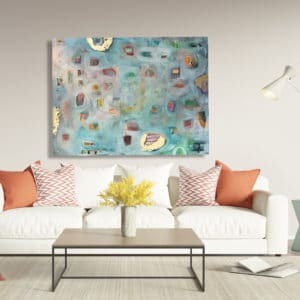 Donna’s paintings are perfect for a busy space; they are quiet in their content so they create a wow factor in your room, while not being too bold and overpowering other elements in the room. Depending on which of Donna’s paintings you choose depends on where best they go. From meeting room to the end of a hallway, even above the bed. Jody’s work is particularly good for bringing more life to a space without being too busy. Really good for childrens bedrooms and lounge areas. Sue Collins’ paintings are inspired by the NZ landscape. By abstracting and accentuating different aspects, Sue creates incredibly unique depictions of the landscape. Her paintings are incredibly successful due to how she balances the content in her paintings while being representative of the landscape. The viewer can get lost in the shapes and colours of the artwork. Taking you on a journey into her imagination. Sue’s paintings are perfect for people’s who want to capture the bach style in their home. The sandy grays and browns are super relaxing and tranquil, making the perfect match for a bedroom or lounge. Pedro is a master of natural browns and yellows. Whether his paintings are of a sunrise through the fog or a close up of a gold mind, it is up to the viewers. Pedro’s control of colour makes his art the perfect addition to the home where you don’t want a painting to show a definite image. Pedro’s paintings are handy when you have large and awkward spaces to fill. 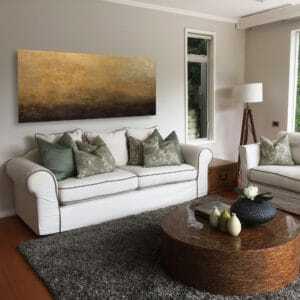 If you already have a lot of items in a room, a calm and sublime abstract piece from Pedro can tie the place up nicely. At a glance, Kristian’s paintings look abstract, but they’re actually made up of shapes that resemble leaves and plant life. The repetition of the shapes creates an abstract pattern that is incredibly hypnotic and textured. 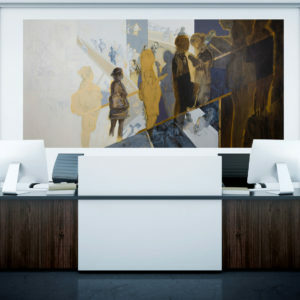 Because of the intense texture and massive scale of Kristian’s artwork, the lounge or office is the place for his work. The texture and pattern while not immediately discernible, can be quite overwhelming, his work is best paired when you have furnished with minimal texture. 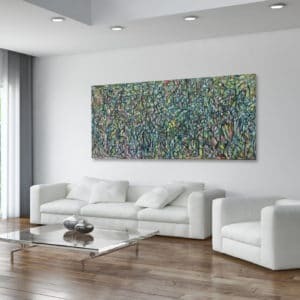 You may be thinking; “this sounds like a lot of work… why put art in my home? viewing art gives the same pleasure as falling in love. orbitofrontal cortex of the brain, resulting in feelings of intense pleasure. affection, pleasure, and romantic love. 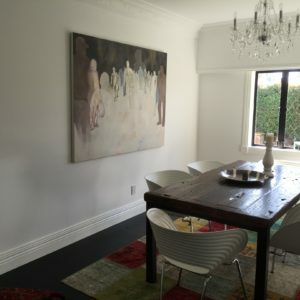 Still not sure about large paintings? Arrange for a free consultation, we can assess your home and pick the perfect selection for you to choose from. Renting options available.